Any trade show the size of something like last week’s NPE2012 in Orlando, FL, clearly needs at least a few days to see with any real measure of thoroughness. I had a whole six hours. While I was in town the day before to attend the ICE USA 2013 Steering Committee meeting, I had to leave by a day later to get the next issue of Converting Quarterly off to my art director and managing editor. 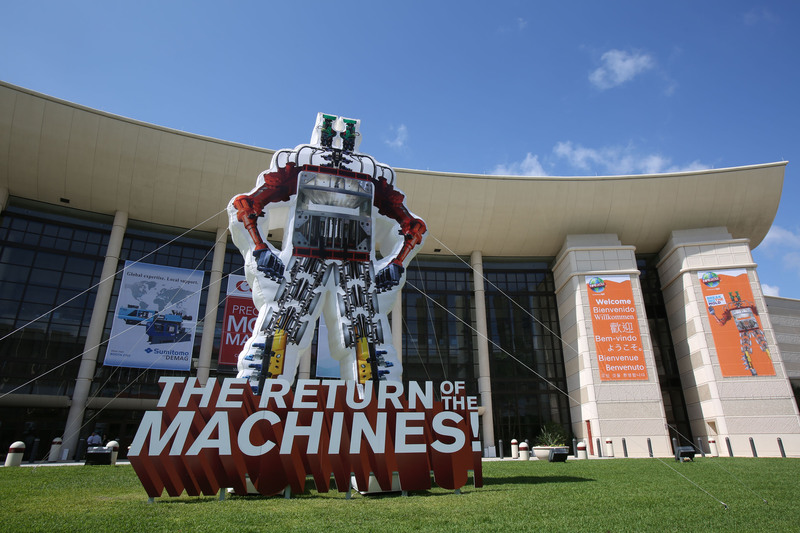 Consequently, here’s my brief—but hopefully helpful—review of some important developments on display at NPE2012. Dow Performance Packaging and Nordmeccanica collaborated with a joint exhibit of an adhesive lamination with high-clarity film. The outside skin of the lamination film was a blend of two Dow LLDPEs. The subskins were composed of ELITE™ 5940G polyethylene for a balance of stiffness and toughness, a Dow LLDPE for toughness in the core without optics impact, and the interior sealant was SEALUTION™ 210, the newest of Dow’s peelable sealant offerings targeted at high-clarity, easy-opening applications. The film was laminated to reverse-printed, 0.5-mil PET with new MOR-FREE™ fast-curing adhesive. No detectable amine levels are achievable in as few as two days, depending on extraction temperature and film construction, and further processing is possible within a shift, Dow says. The lamination was made on the Nordmeccanica SUPER SIMPLEX™ laminator, which is capable of 1,200-fpm speeds. Parkinson Technologies exhibited a new Dusenbery® Converting Systems Genesis 700 slitter/rewinder. The entry-level model offers both strong value and performance. Brückner Maschinenbau offered new line concepts for efficient, flexible production of battery-separator film, including output capacity of up to 30 million sq meters/yr, 12-30 micron film thickness, 4.2-meter-wide net film and no separate annealing tenter. Davis-Standard displayed a variety of extrusion and converting technology geared toward energy efficiency, product versatility and maximum productivity. Among the systems: A 75-mm (3-in.) Thermatic® HS high-speed extruder for increased outputs and performance; a running compact HPE-H extruder with a direct-drive AC vector motor with fully integrated KXE-I808C inspection system for continuous flat film and sheet; and a new three-layer blown-film Vertex die technology with improved internal bubble cooling. NDC Infrared Engineering had a new application for its Model 8000—a scanning blown-film web-gauging system to measure and control complex, multilayer products—the DLSA (Double Layflat Separation Algorithm) and the APC (Automatic Profile Control). CMD Corp. launched its efficiency-focused bag-on-a-roll system. The Model 0864GBW Global Bag Machine and Winder give converters proven technology, simple operation, low maintenance and fast changeover. Gloucester Engineering Co. (GEC) displayed a range of blown and cast film, sheet and foam extrusion products, including an improved 4180 bag machine. At the show, Leon, Mexico-based Grupo REYMA placed a US$6 million order for four new monolayer polypropylene sheet lines, which will go into the company’s Nogales plant. 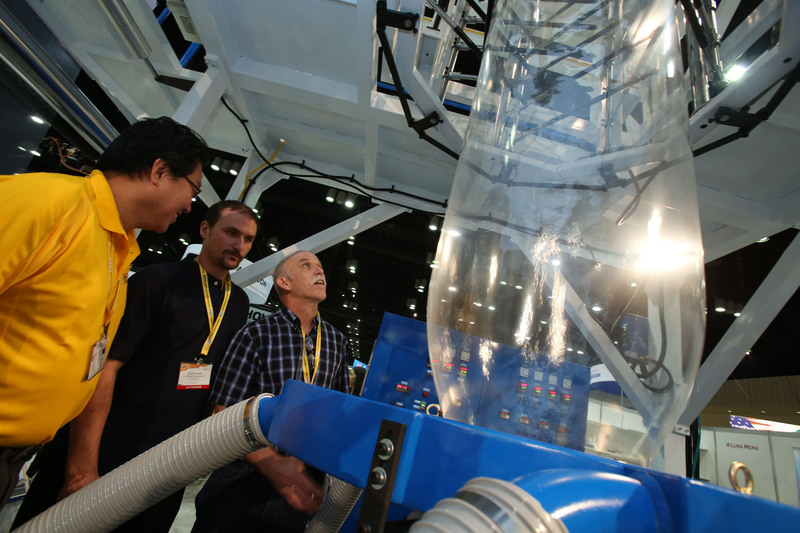 As they like to say in TV-show previews, there was “All this…and more” at NPE2012, but what can one do with barely a day to cover the 1,900 exhibitors across 900,000 sq ft.
Want more plastics-extrusion technology? 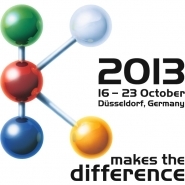 Stay tuned for the next installment of the K Show, set for Oct. 16-23, 2013, at the Fairgrounds in Düsseldorf, Germany. This entry was posted in coating/laminating, flexible packaging, slitting/rewinding and tagged adhesive lamination, converting, flexible packaging, ICE USA, packaging, plastic film, slitter rewinder, technology. Bookmark the permalink.